Research recently conducted by the Matsec Support Unit on the ease with which students sitting for examinations can read different typefaces, and whether students with dyslexia have different preferences, has re­vealed that the most readable font for the majority of students is Verdana. Matsec exam papers have traditionally been written using Times New Roman because this font allows readers to distinguish between the number ‘1’, capital letter ‘i’, and letter ‘l’, apart from the fact that it was the standard font in Microsoft Word. However, there have been various suggestions to use other typesets such as Arial, Georgia, Verdana and Helvetica, among others. Other fonts, such as Comic Sans, have been specifically suggested for students with dyslexia. The unit conducted two surveys to discover respondents’ preferences out of a selection of nine typefaces. The first survey was conducted among 3,000 students who sat for Matsec exams, of which 458 students responded to the questionnaire. The findings suggested that Verdana was the preferred font, as shown in figure 1 above. The survey did not take into consideration differences in font size. The unit conducted a second survey among students in secondary and post-secondary schools (see fig.). A total of 314 students took part in this survey, which also considered differences in font size. The survey again found Verdana to be the preferred font. 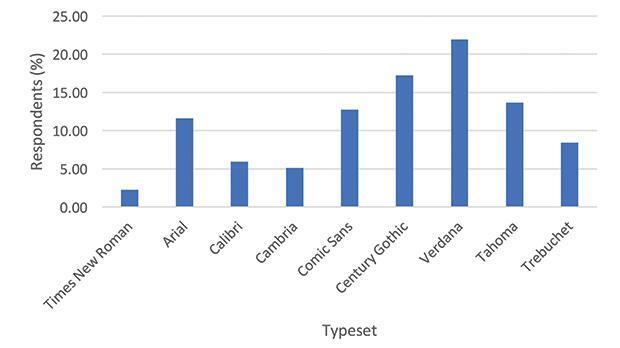 Comparing the results of both surveys revealed that accounting for font size changed the ranking of typefaces. Arial, for instance, gained considerable momentum and the difference between this font and Verdana was minimal. 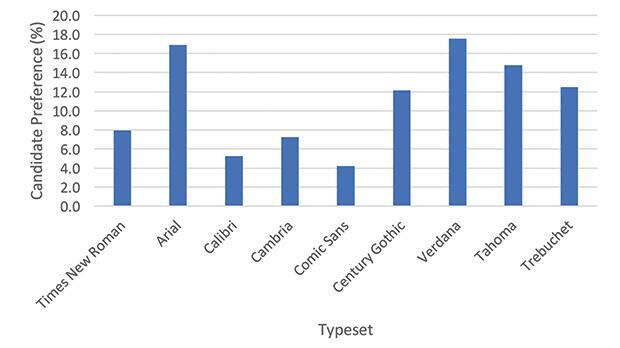 Comic Sans, on the other hand, was ranked as the least preferred typeset when account­ing for its larger size. Some differences between students with dyslexia and those without a condition exist. There were also minor differences between male and female students. Arial, rather than Verdana, was the preferred typeface for male students and for students with dyslexia or other conditions. However, the unit said that Arial fails to distinguish between the letter ‘l’ and capital letter ‘i’, and was therefore not deemed to be an appropriate typeset to be used in exam papers. The full report of the research is available at the link below. Feedback may be sent on matsec@um.edu.mt.